The origins of the Abbots Bromley Horn Dance are hazy and in trying to make sense of this centuries-old tradition, the phrase ‘fertility ritual’ often crops up. Apparently, one of the most potent elements of the dance is coming into contact with the pig’s bladder on a stick, wielded by the fool (1). 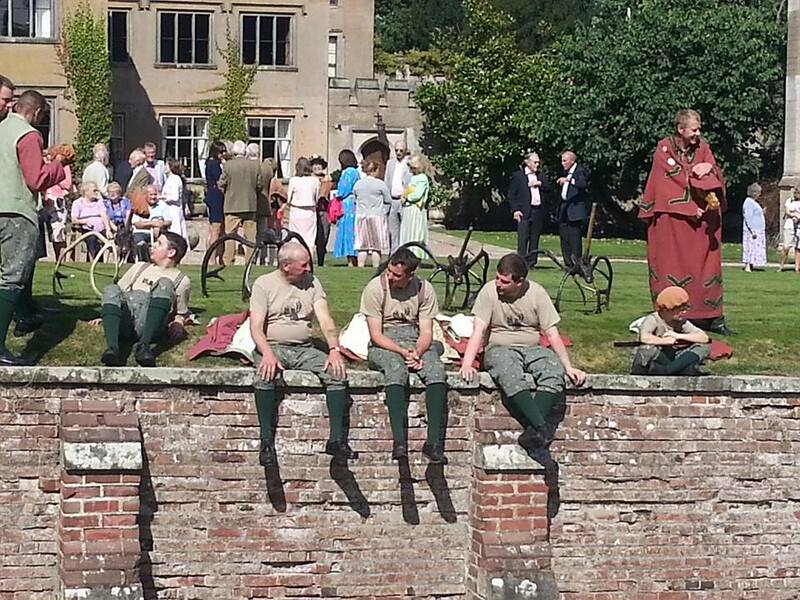 Sitting below the ha-ha, separated from the dancers performing on the lawn outside Blithfield Hall by a big ditch, seemed like a safe enough distance to watch from this year. 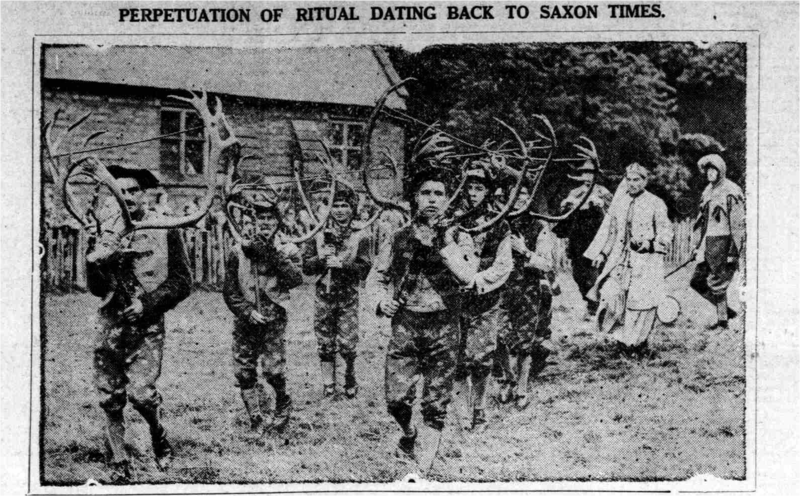 The Abbots Bromley Horn Dance taking place in 1932. 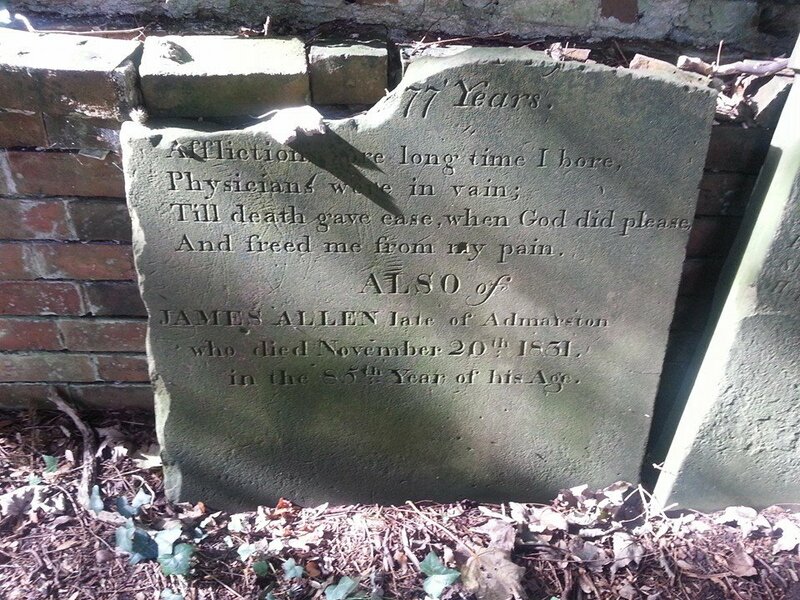 Taken from the ‘The Birmingham Mail’ via ‘The Lichfield Mercury’. 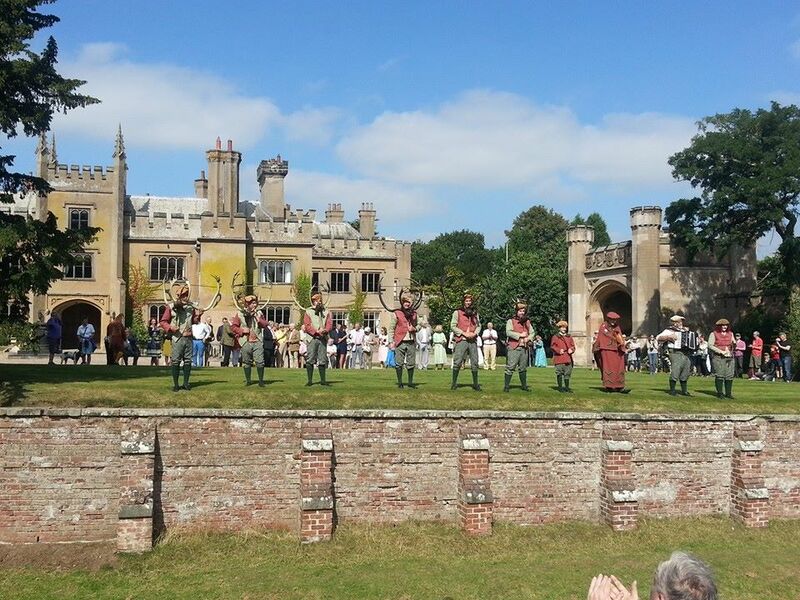 Once the performance had ended, the dancers bowed to those of us in the cheap seats and went for lunch inside the hall, which has been home to the Bagot family since 1360. 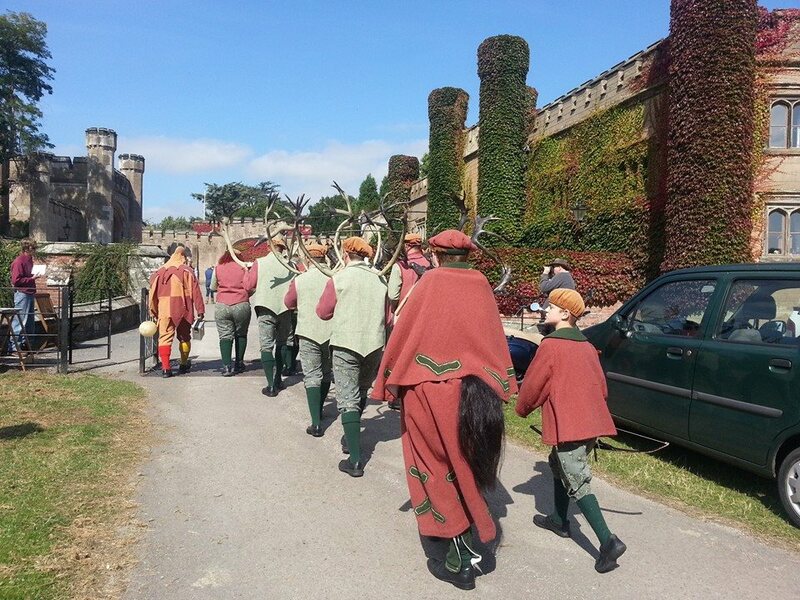 Afterwards, they would head back to Abbots Bromley, to perform the dance through the lanes and outside the pubs of the village, returning the horns to the church of St Nicholas at around 8 o’clock that evening. I was heading back to Lichfield, but thought there might just be time to pay a visit to a church myself. “St Leonard’s is just over there at the back of the hall…”, explained a man selling guide books from a stall “….but you can’t go that way unless you live there”. He did explain how non-Bagots could get to the church but on the way back to the car I got sidetracked by another stall selling honey, and so the church had to wait for another day. Another day came at the start of October. 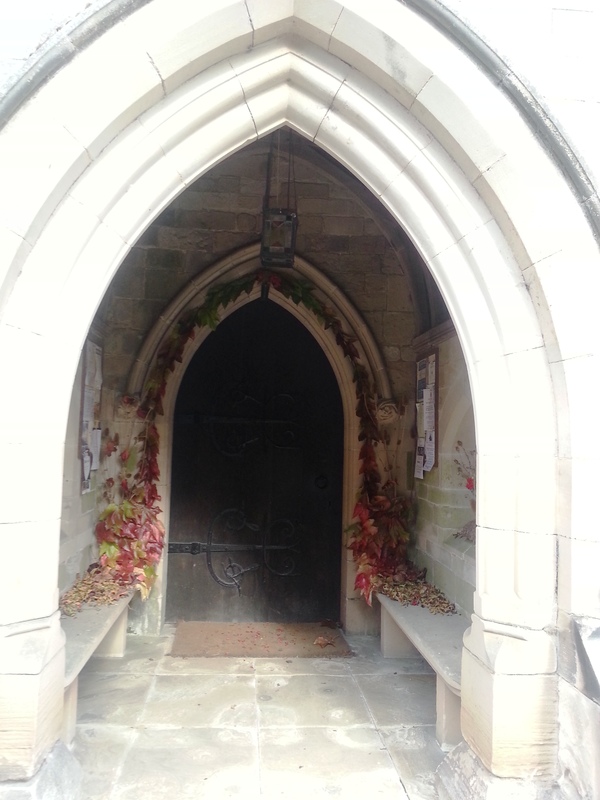 The church door, beautifully decorated with autumn leaves, was unfortunately locked. 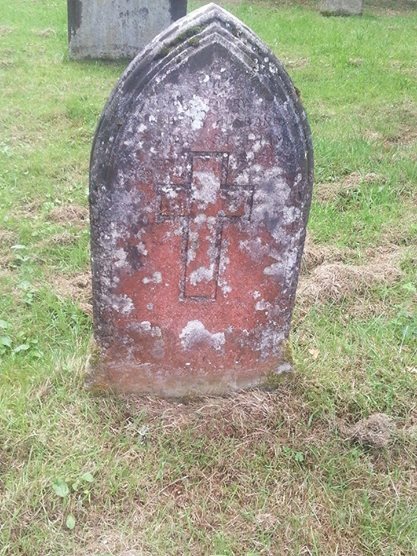 I had to break the news to my Mum that we wouldn’t be able to see Staffordshire’s only surviving pillar piscina, dating from the early twelfth century. Oddly, she didn’t seem too bothered….It turned out that being restricted to the outside of the church was actually a blessing in disguise as the exterior of St Leonard’s turned out to be a very interesting place indeed. 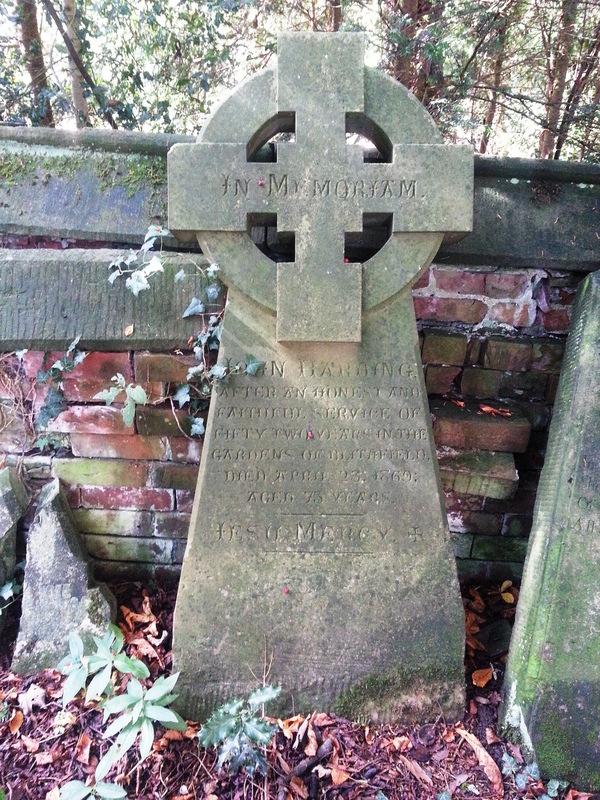 Built into the red-brick, eighteenth century wall which separates the churchyard from the grounds of Blithfield Hall is a gateway (also locked! 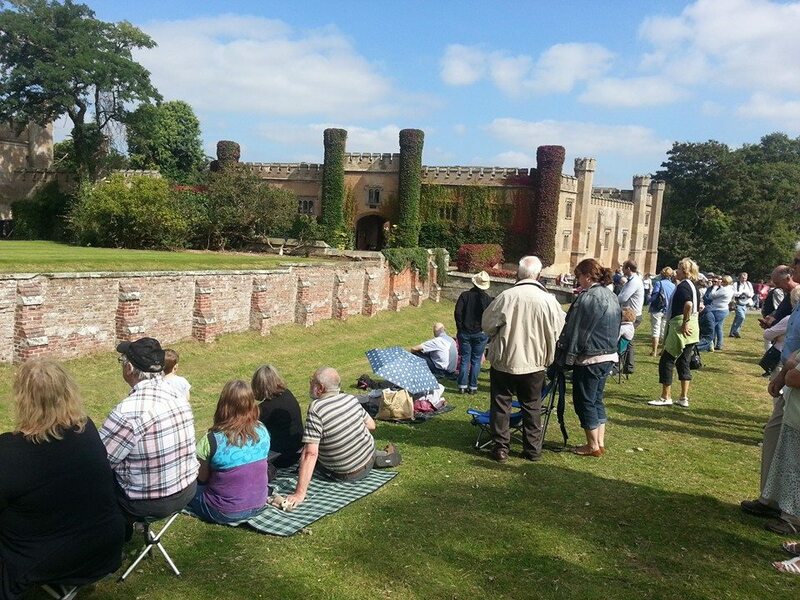 ), which looks ancient but actually only dates back to the mid-nineteenth century. This is clearly the Bagot family short-cut to the church that I had heard about at the Horn Dance. A little more difficult to find is a satisfying explanation for the circular feature, also built into the wall, which appears to have been added around the same time. 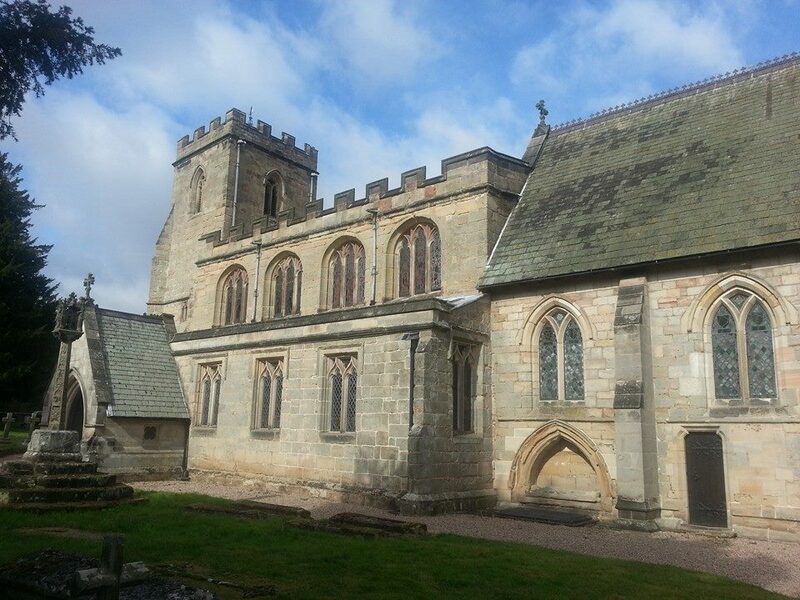 According to a description in the Lichfield Mercury, as part of their 1891 series ‘Sketches in and around Rugeley’, it was, “formed for the purposes of seeing when the parson came to church so that the Squire might not be kept waiting longer than was necessary in a cold church”. I’m not convinced by this but it’s all I’ve got at present. 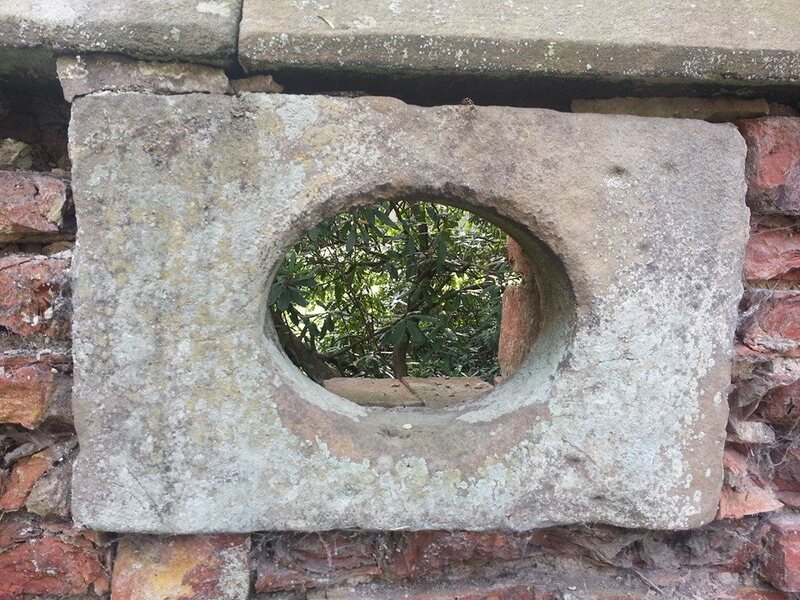 After looking through the round window, anyone over the age of twenty five may be quite excited to hear that there’s also an arch and a square here. Anyone younger than that won’t have a clue what I’m talking about. 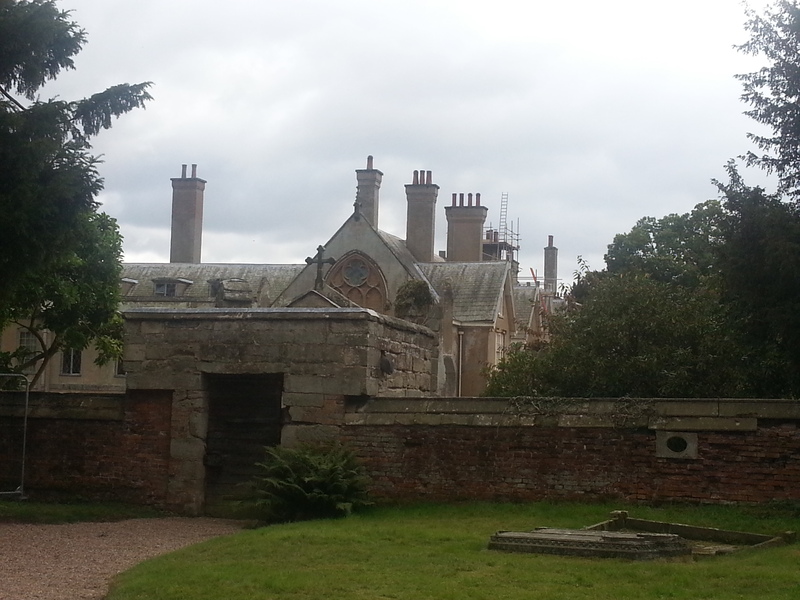 Anyway, as these are niches than windows, it’s more a case of looking into, rather than through them. 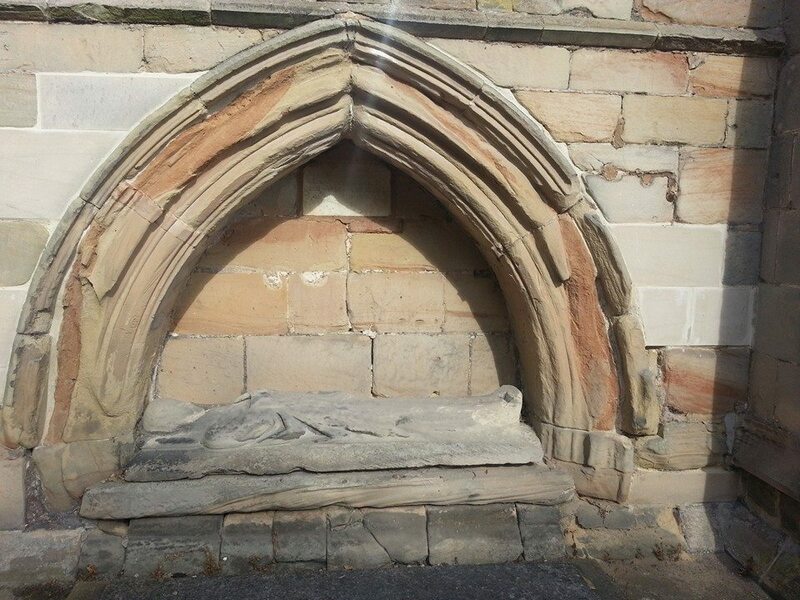 The arch is found on the south side of the church, sheltering the thirteenth century effigy of a priest. A comparison with this drawing of 1823 shows that sometime time can diminish rather than increase the lines on a face. A late seventeenth century marble plaque with Latin script implores us to pray for the soul of Alfred, priest of Hulcrob. Records show that the words on the tablet were originally written around the arch in letters of gold but these have long since been erased by time. 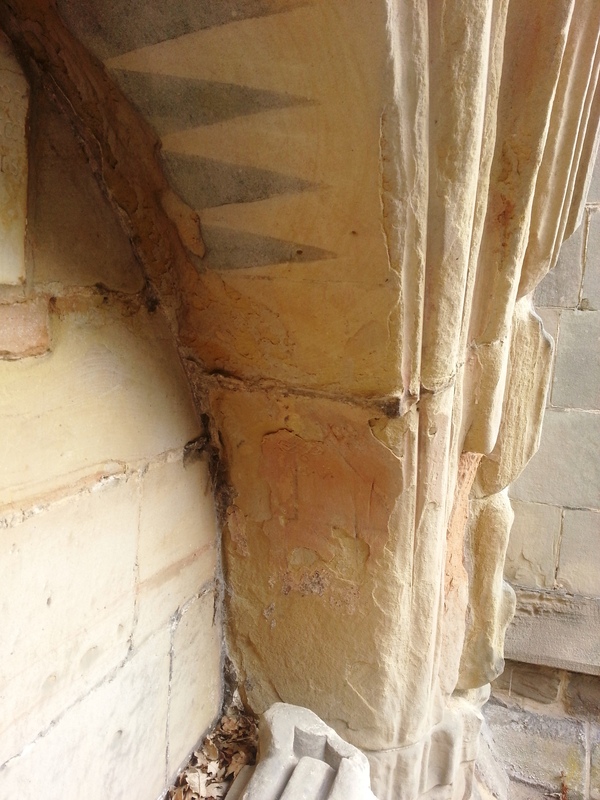 Faded painted patterns still remain on the interior curve of the arch though and it seems reasonable to assume that these would have been part of this decorative inscription? 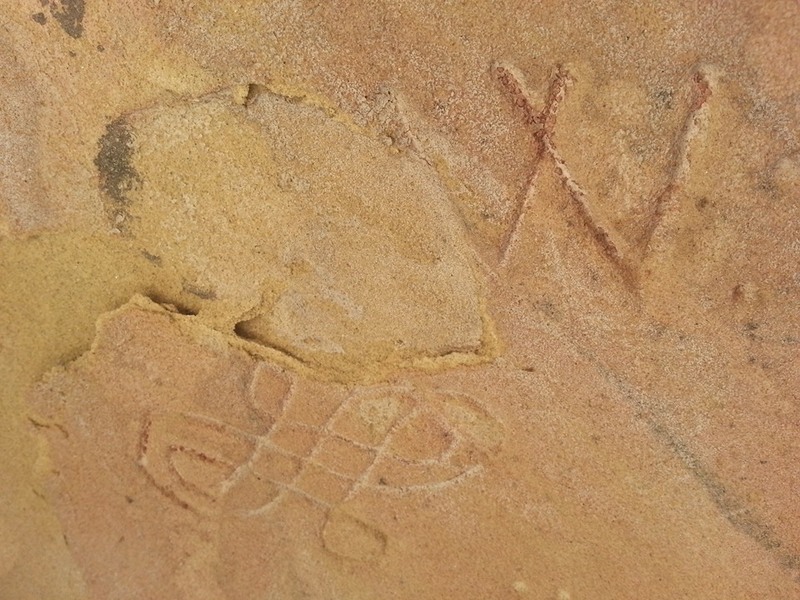 There are also several ‘graffiti’ marks carved into the stone here, at least one of which appears to be a ritual protection mark associated with the Virgin Mary. 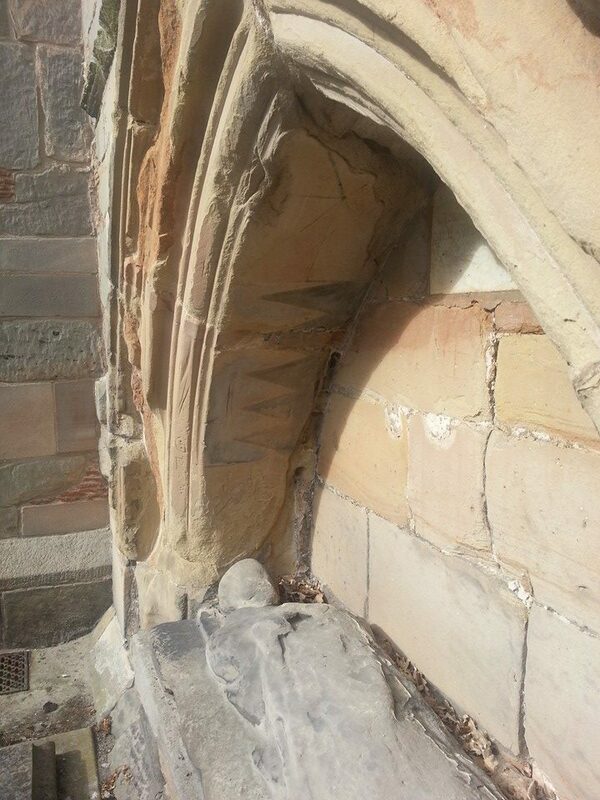 On the north side of the church, near to the tower, is the feature I’m calling a square but which the Lichfield Mercury article describes as, “a curious recess, the use of which it seems very difficult to determine. It could have had no communication with the inside of the church, for it is in the thickness of the wall of the nave, and being outside it can hardly been of any use as an aumbry“. 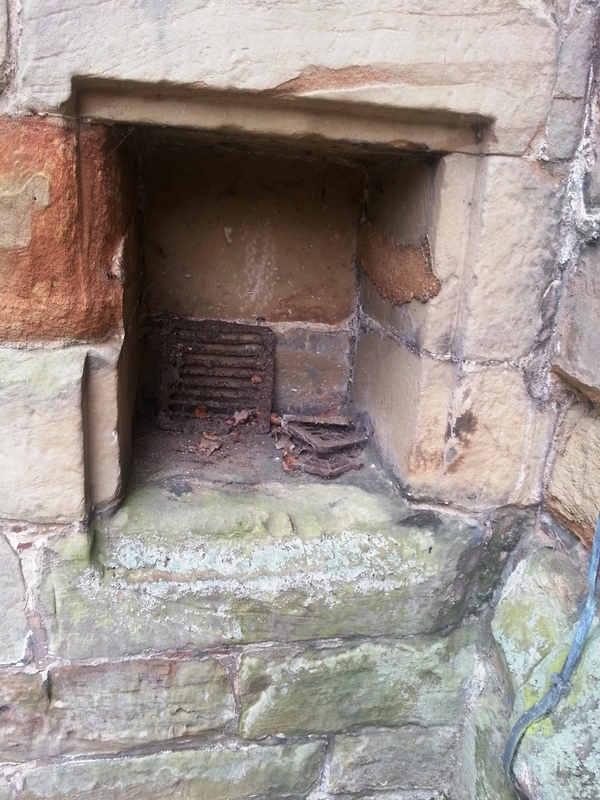 In ‘Collections for a History of Staffordshire’ (1919), its similarity to an aumbry is also noted, leading the author to speculate that this may once have been an interior wall and that possibly there may have been an annexe or a anchorite’s cell here. 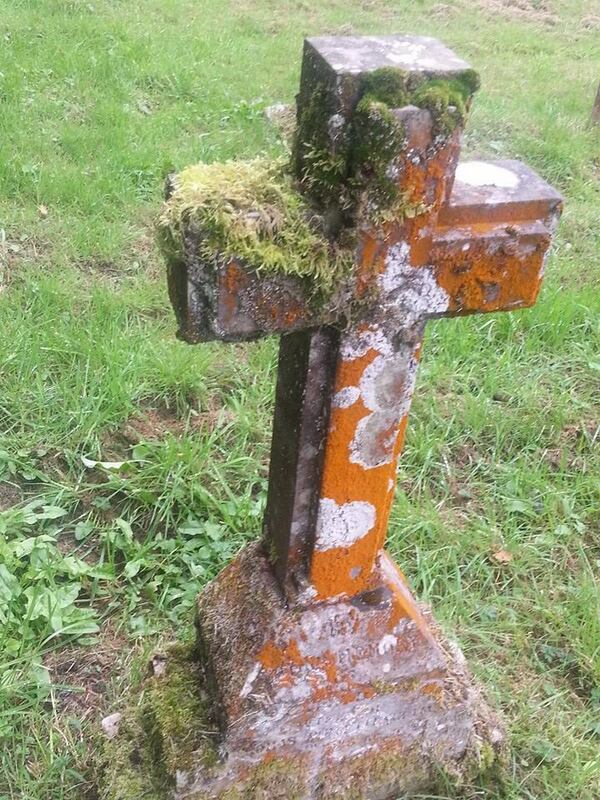 All I can spy with my non-expert eye is that it does look as though it may once have been covered by a grille or a door, although I’m not sure whether the actual bits of rusty grate lying inside it are a clue or a red herring. 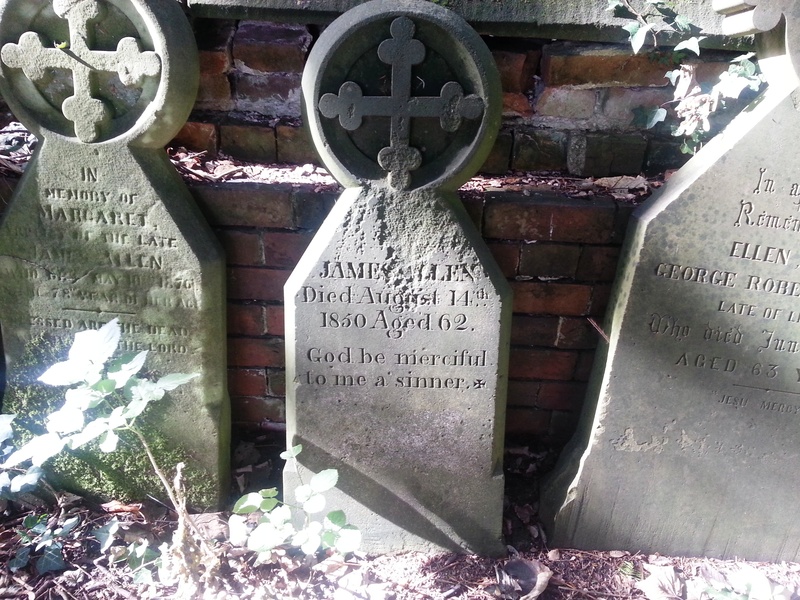 Alongside the various memorials belonging to members of the Bagot family (although many of these are inside the church itself) are those belonging to people who, like most of us, would have had to come the long way round. 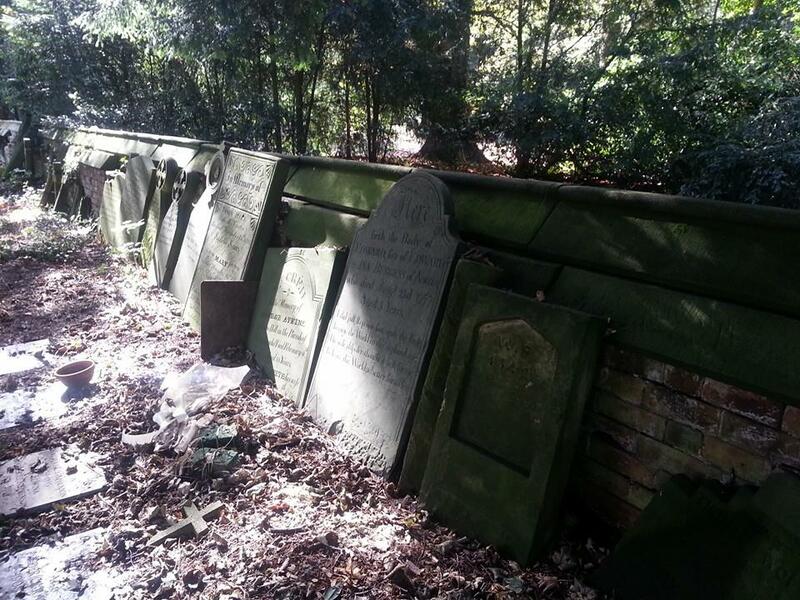 I was always concerned that an interest in graveyards was a little morbid but the excellent talk David Moore did on symbolism in cemeteries for Lichfield Discovered recently reassured me that graveyards are as much about life as death. And not just human life either….